Changes in the structure and/or the expression of protein-coding genes were thought to be the major cause of cancer for many decades. However, the recent discovery of non-coding RNA (ncRNA) transcripts suggests that the molecular biology of cancer is far more complex. MicroRNAs (miRNAs) are key players of the family of ncRNAs and they have been under extensive investigation because of their involvement in carcinogenesis, often taking up roles of tumor suppressors or oncogenes. Owing to the slow nature of experimental identification of miRNA genes, computational procedures have been applied as a valuable complement to cloning. Numerous computational tools, implemented to recognize the characteristic features of miRNA biogenesis, have resulted in the prediction of multiple novel miRNA genes. Computational approaches provide valuable clues as to which are the dominant features that characterize these regulatory units and furthermore act by narrowing down the search space making experimental verification faster and significantly cheaper. 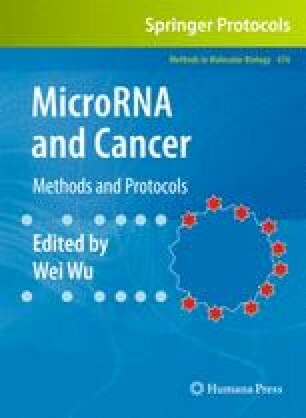 Moreover, in combination with large-scale, high-throughput methods, such as deep sequencing and tilling arrays, computational methods have aided in the discovery of putative molecular signatures of miRNA deregulation in human tumors. This chapter focuses on existing computational methods for identifying miRNA genes, provides an overview of the methodology undertaken by these tools, and underlies their contribution toward unraveling the role of miRNAs in cancer. This work was supported by the action 8.3.1 (Reinforcement Program of Human Research Manpower – “PENED 2003” (03ED842)) of the operational program “competitiveness” of the Greek General Secretariat for Research and Technology, a Marie Curie Fellowship of the European Commission (PIOF-GA-2008-219622), and the National Science Foundation (NSF 0515357).